During the early 1950s, you could not get away from chlorophyll at the grocery store—all thanks to a thinly sourced belief that the plant pigment fought odors. The year that Dutch researcher Jan Ingenhousz released a book titled Experiments upon Vegetables—Discovering Their Great Power of Purifying the Common Air in the Sunshine and of Injuring It in the Shade and at Night, a work with an extremely long title but an even more important role: The book bounced off the also-groundbreaking work of chemist Joseph Priestley, who discovered oxygen, as well as plants’ roles in producing it; Ingenhousz added the all-important element of the role of light in plants’ creation of energy, a role that chlorophyll is central to. The duo, between them, came up with the basic tenets of photosynthesis, the process that turns nutrients from carbon dioxide and water into energy, with oxygen the byproduct. One might imagine that chlorophyll’s important role as nature’s air filter might be enough to impress the public, but scientists who kept digging for potential benefits of this wonder material helped set the stage for a short-term fad. There are two researchers we need to thank for the success of chlorophyll, the mass-market dynamo: Dr. Benjamin Gruskin and Dr. F. Howard Westcott. Dr. Gruskin, a Temple University researcher, got started first, experimenting with chlorophyll for roughly a decade starting in 1930 on a wide variety of different things, including the fast healing of burns and wounds. Gruskin’s work led him to patent the use of chlorophyll in water soluble solutions in the late 1930s. A few years after Gruskin’s own research, Dr. F. Howard Westcott was on the lookout for an anemia cure, but instead stumbled upon chlorophyll’s allure as an odor-blocker. Unlike Gruskin, however, he immediately took sharp notice of it. An article from Time Magazine dating to 1950 noted that Westcott first noticed the pigment’s apparent deodorizing abilities related to Vitamin B and asparagus, two nutritious things that happen to have a pretty bad smell. After this Eureka moment, he then did a small test involving a doctor and four nurses, giving them a dose of chlorophyll, then having them measure their underarm odor over a daylong period. Somehow, taking chlorophyll appeared to cut their B.O. in half. Later, he expanded the test to a larger group college students, with similar results. It wasn’t long before the marketers of the world noticed the work of these two doctors. In the case of Gruskin, it came in the form of a guy who wanted to buy his patent. Salesman O’Neill Ryan Jr., who was on the search for a new drug to sell, bought out Gruskin’s patent and started marketing the heck out of it. Buying that patent, which was in effect throughout the early 1950s, proved a stroke of genius—especially after Ryan was forced to essentially go it alone because he couldn’t sell any companies on the concept. Well, until he could. “It wasn’t long before some of those cold shoulders I’d run into were turning pretty hot,” Ryan explained to the AP. Even that clever turn of phrase might be putting it lightly. Chlorophyll was the hottest commodity around for a while. The amount in revenue that chlorophyll products were expected to earn in 1953 alone, according to an estimate reported in Popular Mechanics that year. (And that was at the low end—the estimate topped out at $120 million, a range that suggests that they didn’t know how big the fad actually was gonna get!) Around this time, chlorophyll had somehow gained a mighty reputation as a wonder drug, along with a nickname: “Green gold.” It was used in products all throughout the grocery store. In other words, it was the CBD of its day. 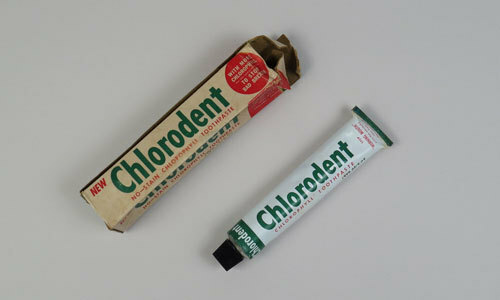 Chlorodent toothpaste, sold by Lever Brothers, benefited from O’Neill Ryan Jr.’s patent to become perhaps the most prominent example of chlorophyll in a mainstream product. This was helped, in part, by aggressive, in-your-face advertising that played up the odor-removing element of the toothpaste. Hale Cigarettes offer a great reminder that the 1950s were not the 2010s. Promoted with a serpent-style medical logo, the cigarettes featured a mouthpiece that “Chloro-Filters the smoke,” whatever that means. 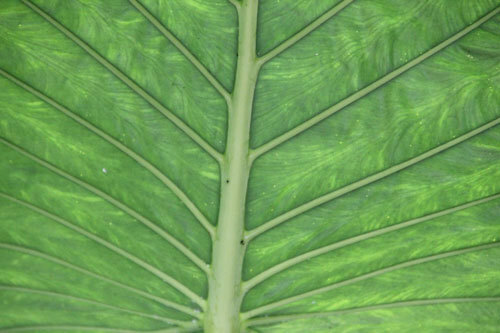 Why did chlorophyll take over so quickly—and why did it fade out? It was pretty clear interest in chlorophyll had gotten out of hand: A Detroit Free Press headline called 1952 “The Year Everything Turned Green,” and the proof is in the pudding—a search on Newspapers.com shows that 1952 and 1953 were by far the most popular years for chlorophyll-related discussion. 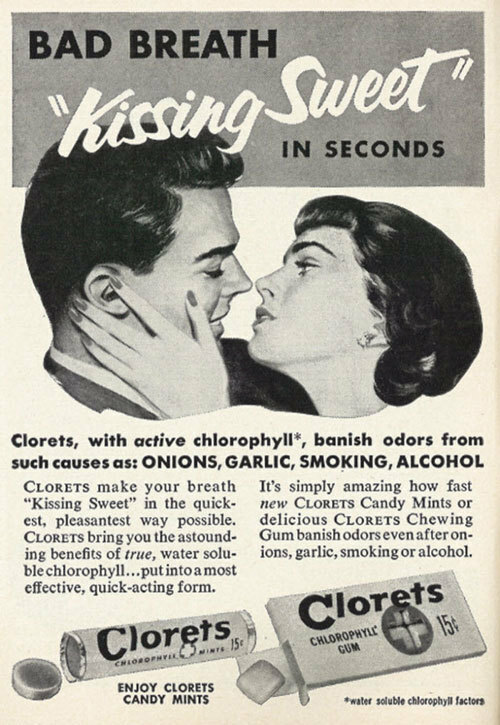 Two factors were at play in the chlorophyll craze: One, with World War II over, manufacturers were likely gaining excitement about new things to sell; two, the 1950s were a good time for fads—and in an era when new mass mediums such as television were picking up, which meant that a miracle product could cut through really effectively. And there was room for success even for those who didn’t license Ryan’s patent, which only covered the water-soluble form of chlorophyll. Westcott’s research surfaced in the form of pills that weren’t included in that patent. There were medical benefits to chlorophyll that had been discovered—Dr. Benjamin Gruskin had been digging far too long to have his findings completely dismissed—but they found themselves competing with a juggernaut of hype around the status of the material as a deodorant. Eventually, the adults stepped in and tried to put a stop to the hype train. In 1952, the Food and Drug Administration specifically spoke out against the claims that chlorophyll was a deodorant, though a top official, Morris L. Yakowitz noted it would be difficult to properly test the claims made by the myriad number of products that were on the market at the time. And by the end of that year, the Federal Trade Commission stepped in to increase scrutiny of products featuring the additive. Rep. Leonor Sullivan, the first woman to serve in Congress from Missouri, noted in a 1953 Associated Press article that the aggressive marketing of chlorophyll additives pointed out a divide at the time between the FDA, which regulated products, and the Federal Trade Commission, which regulated marketing. “In spite of the fact that science hasn’t been able to prove that it deodorizes, almost every product taken externally or internally advertises the magic ingredients,” she told the AP. The Journal of the American Medical Association probably did some of the best work on this front, by pointing out that Dr. F. Howard Westcott’s small-scale tests of his coworkers’ body odor probably didn’t pass the smell test, at least as far as the scientific method was concerned, and ripped the lid off the whole fad with a casually devastating bit of logic. “One should consider the fact that many herbivorous animals, including the goat, consume, large quantities of chlorophyll, and some of these are noted for their pungent aroma,” the association stated in its magazine. The phrase “got your goat” comes to mind. — Rio Viera-Newton, a writer for New York Magazine’s The Strategist blog, discussing her use of a chlorophyll face mask, which she noted had gotten buzzed about “from seemingly everyone on the internet: YouTubers, beauty writers, and Amazon reviewers alike.” In recent years, chlorophyll’s rep has gone from odor-buster to skin rejeuvenator. In recent years, chlorophyll has made a bit of a comeback as a health food and cosmetic ingredient, with folks consuming the substance to help them lose weight, prevent cancer, or get any number of health benefits from it. The consumption model is simple: Add some chlorphyll liquid to water. No toothpaste required. The claims that chlorophyll makes a good deodorant are still around, but have receded in favor of other health claims. Gwyneth Paltrow, who has become something of a target for wacky health claims thanks to her juggernaut online platform Goop, has at times extolled the virtues of chlorophyll—and of course, been criticized for it by publications like The Daily Mail, which obviously have room to talk about things like integrity. “You can get the vitamins you need from eating fruits and vegetables, so in terms of whether it is essential, it is not,” one dietician, Rebecca McManamon, told the publication. I won’t do the diving in on this portion of the conversation, because I’m sure others have stronger opinions about it than I do. But I will point out that there’s an interesting cultural chasm highlighted by the way chlorophyll was discussed as an additive in the 1950s versus how it’s embraced now. Circa 2019, it’s treated as this raw material that is basically consumed or used naturally on its own. But in the 1950s, it was treated as a clever add-on to heavily-mass-produced stuff, a chemical to accent all the other chemicals. It’s a great dichotomy and one that really highlights the evolution of what we consider “health food.” In the span of about 70 years, we’ve gone from highly formulated to raw. Meanwhile, if you eat green vegetables, you’re consuming lots of chlorophyll without any additional work. Just as Mother Nature intended it. Find this one an interesting read? Share it with a pal! And pass the chlorophyll.